"We will need the full genius of this self-regenerative universe to help us navigate through what could very well become a more and more narrow passage to a benign future. I hope that my life can serve as a hopeful sign to help you and all of humanity through the trials and tribulations that will undoubtedly come our way in the not distant future. It won't be smooth sailing I can tell you that much. The seas will get very rough. Spaceship Earth is at least ninety degrees off course. You see, in such a situation, a course correction of a few degrees just won't do. We need to actually take the helm and turn her hard into the wind. We need to really change our tack and not just make empty gestures. This is going to take a tremendous amount of power. Once we have the power only our integrity can see us through the storm that is approaching." Using oil to produce flexible nano enabled polymers that generate electricity from the sun is certainly a higher and better use than burning such complex hydrocarbons in cumbustion engines. This is the innovation upon which Massachestts based Konarka is building its company. According to the company, "Konarka’s products take light in and deliver power out. This direct current (DC) electrical energy can be used immediately, stored for later use, or converted to other forms of energy. Because Konarka’s technology utilizes a wider range of the light spectrum than conventional solar cells, all visible light sources — not just sunlight — can be used to generate power." With funding from investors Silicon Valley Bank, Chevron, the Massachusetts Technology Collaborative and a host of venture capital firms, Power Plastic (tm) might actually get to market. Guess who is getting a first crack at this new technology? Why the military of course! Currently Plastic Power is being developed for portable, electric-generating quonset huts. Other military applications include battery charging on the battlefield, remote power for unmanned vehicles and soldiers, and solar-powered sensor networks. Konarka also envisions using the power-generating capabilities of Power Plastic(tm) to structures including tents, awnings, roofs, windows and window coverings. And they plan to be the power supply of choice for consumer electronics such as cell phones and portable music players as well as business products such as PDAs, and laptops. There are no hard specs or effeciency analyses on the company's website as far as I can tell. The big breakthrough lies in the claim that the photo reactive material is lightweight, coatable, flexible, more versatile, printable and uses ubiquitous roll-to-roll, easy to scale manufacturing technology. All this is supposed to translate to truly affordable photvoltaics. No wonder they won the 2005 Popular Mechanics Breakthrough Award among numerous others. The Boeing Company has signed a contract to provide 600,000 solar concentrator cells to SolFocus, Inc., a California-based renewable energy company that is developing renewable terrestrial energy alternatives. Under the 12-month contract from SolFocus, Inc. of Palo Alto, Calif., Spectrolab will build and deliver 600,000 solar concentrator cells that will be used to convert the sun's rays into affordable electricity for homes and businesses. The cells produced for SolFocus will be capable of generating more than 10 megawatts of electricity, or enough to power about 4,000 U.S. homes. With the average solar cell efficiency above 35 percent at concentration, Spectrolab's concentrator photovoltaic cells generate electricity at a rate that can be more economical than electricity generated from conventional, flat panel photovoltaic systems. A significant advantage of concentrator systems is that fewer solar cells are required to achieve a specific power output, thus replacing large areas of semiconductor materials with relatively inexpensive optics that provide optical concentration. The slightly higher cost of multi-junction cells is offset by the use of fewer cells. Due to the higher efficiency of multi-junction cells used in the concentrator modules, only a small fraction of the cell area is required to generate the same power output compared to crystalline silicon or thin-film, flat-plate modules. Matthew Orosz, an MIT graduate student advised by Harold Hemond, professor of civil and environmental engineering are working on alternative approaches to solar-based electricity that could significantly cut costs compared to photovoltaics panels. Their goal is to put the ability to harvest electricity from the sun into the hands of villagers in poor countries. "The basic design of Orosz's solar generator system is simple: a parabolic trough (taking up 15 square meters in this case) focuses light on a pipe containing motor oil. The oil circulates through a heat exchanger, turning a refrigerant into steam, which drives a turbine that, in turn, drives a generator." 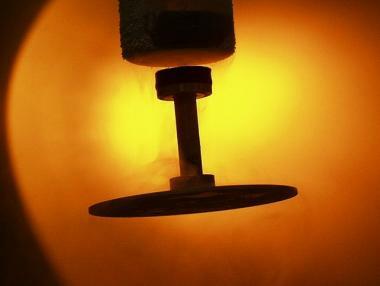 "The refrigerant is then cooled in two stages. The first stage recovers heat to make hot water or, in one design, to power an absorption process chiller, like the propane-powered refrigerators in RVs. The solar-generated heat would replace or augment the propane flame used in these devices. The second stage cools the refrigerant further, which improves the efficiency of the system, Orosz says. This stage will probably use cool groundwater pumped to the surface using power from the generator. The water can then be stored in a reservoir for drinking water." "The design uses readily available parts and tools. For example, both the feed pump and steam turbine are actually power-steering pumps used in cars and trucks. To generate electricity, the team uses an alternator, which is not as efficient as an ordinary generator, but comes already designed to charge a battery, which reduces some of the complexity of the system. And, like power-steering pumps, alternators, including less-expensive reconditioned ones, are easy to come by." "As a result, the complete system for generating one kilowatt of electricity and 10 kilowatts of heat, including a battery for storing the power generated, can be built for a couple thousand dollars, Orosz says, which is less than half the cost of one kilowatt of photovoltaic panels." Chinese developers unveiled the world's first full-permanent magnetic levitation (Maglev) wind power generator at the Wind Power Asia Exhibition 2006 held June 28 in Beijing. Magnetic levitation, maglev, or magnetic suspension is a method by which an object is suspended above another object with no support other than magnetic fields. The electromagnetic force is used to counteract the effects of the gravitational force. Regarded as a key breakthrough in the evolution of global wind power technology — and a notable advance in independent intellectual property rights in China—the generator was jointly developed by Guangzhou Energy Research Institute under China’s Academy of Sciences and by Guangzhou Zhongke Hengyuan Energy Science & Technology Co., Ltd. The Maglev generator is expected to boost wind energy generating capacity by as much as 20 percent over traditional wind turbines. This would effectively cut the operational expenses of wind farms by up to half, keeping the overall cost of wind power under 0.4 yuan ($US 5 cents), according to Guokun Li, the chief scientific developer of the new technology. Further, the Maglev is able to utilize winds with starting speeds as low as 1.5 meters per second (m/s), and cut-in speeds of 3 m/s, the chief of Zhongke Energy was quoted as saying at the exhibition. When compared with the operational hours of existing wind turbines, the new technology will add an additional 1,000 hours of operation annually to wind power plants in areas with an average wind speed of 3 m/s. A proposition by One Architecture, Ton Matton and NL Architects, comissioned by the Dutch government, for a next generation windmill. 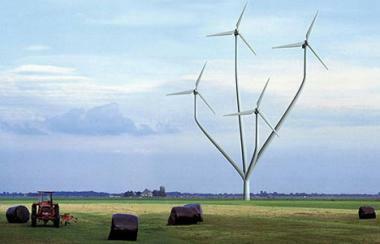 The proposed mill is shaped like a tree and can hold up to 8 turbines and be as high as 120 meters! A tree shaped mill is less intrusive in the flat Dutch landscape than the mill-parks they use.